Objective Hypoglycemia is a frequent and potentially dangerous event among patients with diabetes mellitus type 1. Subcutaneous glucagon is an emergency treatment to counteract severe hypoglycemia. The effect of intraperitoneal glucagon delivery is sparsely studied. We performed a direct comparison of the blood glucose response following intraperitoneally, subcutaneously and intravenously administered glucagon. Research design and methods This is a prospective, randomized, controlled, open-label, crossover trial in 20 octreotide-treated rats. Three interventions, 1 week apart, in a randomized order, were done in each rat. All 20 rats were given intraperitoneal and subcutaneous glucagon injections, from which 5 rats were given intravenous glucagon injections and 15 rats received placebo (intraperitoneal isotonic saline) injection. The dose of glucagon was 5 µg/kg body weight for all routes of administration. Blood glucose levels were measured before and until 60 min after the glucagon/placebo injections. Results Compared with placebo-treated rats, a significant increase in blood glucose was observed 4 min after intraperitoneal glucagon administration (p=0.009), whereas after subcutaneous and intravenous glucagon administration significant increases were seen after 8 min (p=0.002 and p<0.001, respectively). In intraperitoneally treated compared with subcutaneously treated rats, the increase in blood glucose was higher after 4 min (p=0.019) and lower after 40 min (p=0.005) and 50 min (p=0.011). The maximum glucose response occurred earlier after intraperitoneal compared with subcutaneous glucagon injection (25 min vs 35 min; p=0.003). Conclusions Glucagon administered intraperitoneally gives a faster glucose response compared with subcutaneously administered glucagon in rats. If repeatable in humans, the more rapid glucose response may be of importance in a dual-hormone artificial pancreas using the intraperitoneal route for administration of insulin and glucagon. Glucagon is usually given subcutaneously in patients with diabetes mellitus type 1 to treat severe hypoglycemia. Glucagon has also been used in dual-hormone artificial pancreas with some improvement in glucose control. 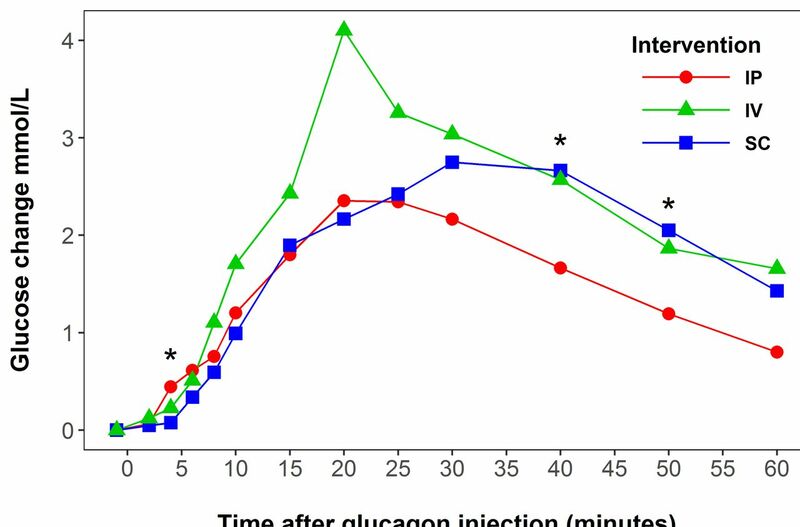 Glucagon injected intraperitoneally gives a higher glucose response 4 min after administration and affects blood glucose for a shorter period compared with subcutaneous injection. The present results should encourage research on the feasibility of combined intraperitoneal administration of insulin and glucagon as part of an artificial pancreas in humans. Recent work on algorithm-steered insulin delivery (ie, artificial pancreas (AP)) provides improvements to glucose regulation. Unfortunately, this automatically controlled (closed loop) delivery of insulin carries certain limitations, as nearly all recent developments depend on a double subcutaneous approach, that is, both glucose measurements and insulin delivery are in the subcutaneous tissue. The limitations are due to slow subcutaneous glucose dynamics secondary to both delayed and slow subcutaneous insulin absorption, which unavoidably lead to alternating periods of either a lack or excess of circulating insulin.20 To solve the challenge of relative insulin excess, some research groups have incorporated glucagon as a counter-regulator in the AP system, to counteract imminent hypoglycemia, that is, a dual hormonal AP.7 21 22 Despite achieving as low as 3% of time in hypoglycemic range during day and night closed loop control, hypoglycemia still remains a substantial daytime problem also in this subcutaneous dual-hormone approach.23 Therefore, new routes should be explored to find better solutions for prevention of hypoglycemia. The main aim of this study was to compare the glucose increasing effect after subcutaneous and intraperitoneal delivery of glucagon, and to investigate the potential for intraperitoneal delivery of small doses of glucagon in an AP. Intravenous delivery of hormones is less realistic in free-living conditions. Therefore, intravenous route was only included in the study as an additional route to obtain more information on glucose dynamics after glucagon delivery, and not included as a main outcome in the paper. We hypothesized that the glucose response is faster after intraperitoneal compared with subcutaneous administration of glucagon. To investigate this hypothesis, we compared the immediate glucose response after intraperitoneal, subcutaneous and intravenous administration of glucagon in an animal model. A pilot study was performed on 10 rats to refine the experimental protocol and to determine the glucagon dose to be used in the main study. Detailed explanation is available in the online supplementary material. In the main study male Sprague Dawley rats (n=20) (initial weight 470–615 g; Janvier Labs, France), in groups of three, were kept in plastic solid bottom cages (515×381×256 mm, Tecniplast, Italy) on sawdust. The rats were acclimatized to the animal facility and maintained on 12-hour light–12-hour dark photoperiod at 20–24°C and a relative humidity of 55%±5%. They were fed expanded pellets (Special Diets Services RM1 for rats, UK) and fresh water was available ad libitum. To reduce stress and the possible effect of stress on glucose levels, the rats were trained to accept general handling and use of a restrainer (Harvard Apparatus, Holliston, USA) for 3 weeks prior to the start of experiments. The rats were monitored for the entire sampling period (70 min) and surveyed for signs of stress. Except when the rats were anesthetized, they were kept in restrainers to facilitate blood sampling. Restrainers of two different sizes were tested before the start of the experiment. For most of the rats, the restrainers were either too large or too small. Thus, the larger restrainer was used for all rats, and a paper tissue was rolled up and taped vertically to the inside of the restrainer at a level behind the rat’s shoulder, to prevent the smaller rats from turning around inside the restrainer. Food was removed 1 hour before the start of the procedure and water was available ad libitum. The individual glucagon and octreotide doses were based on the animal’s weight on the day of the procedure. To suppress the endogenous glucagon and insulin secretion during the procedures, all rats received two subcutaneous injections of 10 µg/kg BW octreotide (Sandostatin 200 µg/mL, Novartis Europharm, UK). The first injection was given approximately 30 min before the start of each procedure and the second at the time of glucagon/placebo injection. Octreotide was given subcutaneously in the neck, but not at the same location as the subcutaneous glucagon injection. To prevent accidental movements in the time of the procedure, the rats were anesthetized with isoflurane (Isoflurane, Baxter, Oslo, Norway; 5% IF, 95% air in chamber; 2% IF, 95% air on face mask) for two short intervals at the start of each procedure. During the first anesthesia period, a cut in the tail for collection of blood samples was made. During the second anesthesia period, an injection of glucagon or placebo was given. When required, additional anesthesia was provided to rats showing signs of stress while kept in the restrainer. Glucagon (Glucagon, Novo Nordisk, Denmark) was diluted by 0.9% NaCl to a concentration of 5 µg/mL and the rats were given 5 µg/kg BW. Glucagon solutions were kept in a refrigerator and used the same day they were made. Solutions were warmed to approximately body temperature just before administration. Subcutaneous glucagon was injected at the back of the neck, and intraperitoneal glucagon and placebo (an equal volume of 0.9% NaCl) in the lower part of the abdomen, with the rat held at an angle after its hind legs. Intravenous glucagon was given in the lateral tail vein that was not currently used for blood sampling. After disinfecting the skin, a 6–9 mm cut was made with a straight-edged scalpel over the lateral tail vein two-thirds down the length of the tail for blood sampling. Samples were collected 10, 5 and 1 min prior to glucagon injection, and 2, 4, 6, 8, 10, 15, 20, 25, 30, 40, 50, and 60 min after the glucagon or placebo injections. Whenever needed, the vein was carefully reopened with the tip of the scalpel to ensure sufficient blood flow for sampling. Blood for glucose analyses was collected directly in heparinized capillary tubes (35 µL, Clinitubes, Radiometer Medical ApS, Brønshøj, Denmark), and stored on ice for a maximum of 30 min before analysis on a blood gas analyzer (Radiometer ABL 725, Radiometer Medical ApS). To ensure sufficient blood flow for sampling, the vein was gently stroked from the base of the tail and toward the wound, and the first small drop of blood was removed. For the third intervention, both veins had been used for sampling at former trials, and the new cut was made proximal to the older cut. Occlusion of the rat’s tail vein occurred in only one rat, and in this case the vein on the other side of the tail was used. The rats were given non-steroidalanti-inflammatory drugs (Metacam vet, Boehringer Ingelheim Vetmedica) 1 mg/kg BW as a single subcutaneous injection at the end of the two first procedures. A suture, to close the wound and stop the bleeding at the end of the procedure, was necessary in 19 cases. The wounds healed well after sampling regardless of the wound being sutured or not, and no wound infections were observed. After the third procedure, the rats were euthanized with an intravenous injection of pentobarbital (100 mg/kg) (Norges Apotekerforening, Norway) under isoflurane anesthesia. The relationship between glucose levels and time was analyzed for all interventions using a mixed linear model with the combination of time and treatment as the fixed effect. The dependent variable was defined as log glucose concentration to achieve normal distribution. To account for multiple measurement series on each rat, rat identification was included as a random effect. To account for dependence within each series, the error term for each series was specified as a first-order autoregressive process AR (1) series accounting for minutes between measurements. Mean changes in glucose concentrations from −1 min to 2–60 min for the four treatments were compared using the Wald test. Maximum concentration and time until maximum concentration of the estimated model for the treatments were compared using the Mann-Whitney U test. To eliminate the effect of placebo intervention on the glucose response, the mean value of the 15 placebo interventions was subtracted from the mean value of the 20 subcutaneous and intraperitoneal interventions and the mean value of the 5 intravenous interventions at the given time points. All interventions are compared as models; therefore, comparison between unequal groups is allowed.27 The software package R was used to analyze the data.28 All values in the text are given as mean±SE of the mean, unless stated otherwise. Differences between the group means were considered statistically significant at a threshold of p≤0.05. In general, the rats stayed calm during the experimental procedures. Thirteen incidents occurred during 60 procedures, in which the rats turned around inside the restrainers or showed signs of stress and consequently were taken out of the restrainer and repositioned. A similar number of incidences were found in all interventions (four during the intraperitoneal, four during the subcutaneous and three during the intravenous intervention). These incidents included two rats in whom stress was observed during three procedures (intraperitoneal, subcutaneous and intravenous). Two incidents of stress were observed during the placebo procedure; however, no increase in blood glucose levels from baseline was observed (data not shown). Additional anesthesia during blood sampling was needed during 10 intraperitoneal, 10 subcutaneous, 5 intravenous, and 5 placebo interventions, and the mean±SD time in anesthesia was 13.8±5.5 min (14.05±5.47, 13.55±4.37, 20±9.43 and 12±4.85, respectively). The rats were conscious for the rest of the 70 min procedure. After individually analyzing data from the 16 rats which received the longest duration of anesthesia (time in anesthesia 15–31 min, subcutaneous n=5, intraperitoneal n=5, placebo n=3 and intravenous n=3), only two rats (subcutaneous intervention, n=2) showed prolonged elevated glucose levels and no decrease of glucose values at the end of the intervention (at 60 min) (data not shown). For calculation of glycemic state for rats at the beginning of the interventions, a mean baseline glucose was calculated according to the mean of three measurements preceding the intervention (−10, –5 and −1 min), and in addition a mean±SD in each intervention group was calculated. Blood glucose levels at the beginning of the intraperitoneal, subcutaneous, intravenous and placebo interventions were 6.72±0.90, 6.47±0.81, 6.17±1.12 and 6.51±0.81 mmol/L, respectively (see online supplementary figure 1). Compared with placebo, glucose was significantly increased 4 min after intraperitoneal glucagon injection (p=0.009, n=20), and 8 min after subcutaneous (p=0.002, n=20) and intravenous (p<0.001, n=5) injections (figure 1). Estimated glucose delta values (mmol/L) after glucagon injection (5 µg/kg) in octreotide-treated rats. Green line represents intravenous (IV) intervention, blue line represents subcutaneous (SC) intervention, and red line represents intraperitoneal (IP) intervention. The glucose response for the placebo group has been subtracted from all groups presented in the figure. *Represents significant difference between intraperitoneal and subcutaneous of glucagon delivery. Note: For one rat in intraperitoneal intervention, delta values were calculated using the −5 minute measurement (−1 minute for other rats). Comparing intraperitoneal glucagon injections with subcutaneous, the glucose increase after intraperitoneal glucagon was significantly higher at 4 min (p=0.019) and significantly lower at 40 (p=0.005) and 50 min (p=0.011) (figure 1). Comparing intravenous glucagon injections with intraperitoneal, the glucose increase after intravenous injection was significantly higher at 20 min (p=0.001). At the other time points, no significant differences were observed. An increase in glucose levels was seen after all three routes of glucagon delivery, but there was no significant difference (p=0.52) in absolute maximum blood glucose value after intraperitoneal glucagon injection (9.74 mmol/L) compared with subcutaneous injection (10.3 mmol/L). The estimated time until the maximum glucose value was significantly shorter (p=0.003) after intraperitoneal glucagon injection (25 min) versus subcutaneous glucagon injection (35 min) (see online supplementary figure 1). The results of this study indicate that the glucose response in rats comes earlier when glucagon is injected intraperitoneally than when injected subcutaneously. Second, the maximum effect of glucose increase appears earlier, and the glucose response diminishes faster after intraperitoneal compared with subcutaneous glucagon injection. Our finding of an earlier rise in blood glucose after intraperitoneally injected glucagon, compared with subcutaneous injection, is difficult to compare with previous studies as blood glucose was measured at different time points and intervals. In previous studies, blood glucose was only measured 2024 and 3025 min after glucagon injection. Moreover, the study by Zlotnik et al 25 provided only data of intraperitoneal glucagon injection. Loxham et al 24 demonstrated results similar to our study, where, after intraperitoneal injection of glucagon in non-diabetic rats, the glucose response after intraperitoneal administration was higher after 20 min and lower after 45 min compared with subcutaneous administration. Baseline glucose levels were also similar to ours. However, the authors did not mention whether anesthetics were used.24 Noteworthy, Loxham et al 24 suggested that different strains of rats may react differently to a sudden rise in counter-regulators (in this case glucagon), making comparison between different strains of rats difficult. Our glucagon dose of 5 µg/kg BW was only 2.5% of the dose used by Loxham et al 24 (200 µg/kg) and only 1% of the dose used by Zlotnik et al 25 (50 µg/100 g). We do not have information about why these particular doses were chosen. Another aspect is that previous authors used naïve rats, whereas the rats in the present study were treated with octreotide.35 Our study provides information about possible doses of glucagon with which glucagon saturation is reached (see online supplementary material). It seems that in our study a glucagon dose of 5 µg/kg BW was appropriate (see online supplementary material) based on the observed blood glucose increase of around 3 mmol/L in all injection routes. A small dip in glucose values was observed prior to the injection of glucagon or saline, that is, during all procedures (see online supplementary figure 1). The reason for this is unclear, but the equal response during all procedures is an indication of consistency of the experimental protocol for all the procedures during the first part of the experiment and thereby a sign of quality of the present study. The following are the strengths of the present study: (1) placebo-treated animals—the importance is illustrated by the fact that, although not significantly, the glucose levels tended to fluctuate also during the placebo procedures; (2) limited use of anesthesia, which may have major impact on glucose homeostasis; (3) systematic training of the rats to the procedures for weeks ahead of the test procedures (both pilot rats and trial rats) to minimize the stress response during the test procedures; and (4) randomization of the order of treatment in each rat. The following are among the limitations of the present study: (1) With unguided injections into the abdominal cavity, we cannot be sure that all the glucagon or placebo was administrated in the peritoneal space. However, glucagon and placebo saline were injected by the same procedure in anesthetized rats (injection could be done without experiencing unexpected movements of rat); therefore, possible deviation from intraperitoneal delivery should be equal between groups. (2) A few rats were stressed during the procedures, which might affect the blood glucose levels. However, in rats receiving placebo intervention, under signs of stress, the blood glucose level did not increase significantly (see online supplementary material). (3) Additional anesthesia was needed for some rats in all interventions; however, as it was described in the results, prolonged increased glucose levels were observed only in 2 out of the 16 rats which were exposed to the longest duration of anesthesia in the main study. Therefore glucose level increase at the end of the intervention can be individual response, not anesthesia-induced. (4) Rats were fasted differently (between 1 and 3 hours) depending on the order of performing the procedure (intraperitoneal, subcutaneous, intravenous or placebo). However, to avoid bias, all experiments on the same rat were conducted at approximately the same time as of the light cycle. Blood glucose increased faster when glucagon was injected in the peritoneal cavity compared with subcutaneous glucagon delivery in octreotide-treated rats. The maximum glucose response was reached earlier and the decline in glucose response was also faster. If repeatable in humans, a more rapid glucose response may be of importance in a dual-hormone AP using the intraperitoneal route for administration of insulin and glucagon. The animal experiments were conducted at the Comparative Medicine Core Facility (CoMed), Norwegian University of Science and Technology (NTNU). CoMed is funded by the Faculty of Medicine and Health Sciences at NTNU and the Central Norway Regional Health Authority. We thank Associate Professor Øyvind Salvesen, Faculty of Medicine and Health Sciences, NTNU, for help with the statistical analysis, and Gita Nagarajah for her work on the glucose analysis.
. Comparative study on lipid changes in glycemic uncontrolled diabetes type 1 and type 2. J Liaquat Uni Med Health Sci 2009;8:201–4.
. wald, likelihood ratio, and lagrange multiplier tests in econometrics. In: . Handbook of econometrics. Elsevier, 1984: 775–826. R: a language and environment for statistical computing. Vienna, Austria: R Foundation for Statistical Computing, 2017.
. The ultrastructure of human abdominal mesothelium. J Anat 1989;167:47–56.
. Effect of isoflurane anesthesia on circadian metabolism and physiology in rats. Comp Med 2017;67:138–46. ID-F and MKÅm are joint first authors. Presented at Data from this study were presented as an abstract and poster at the 11th International Conference on 'Advanced Technology and Treatment for Diabetes', February 14–17, 2018, Vienna, Austria. Contributors ID-F and MKÅ completed the trial, collected and analyzed the data, wrote and edited the manuscript, and are the guarantors of the work. ALF, SMC and SCC contributed to the discussion, and reviewed and edited the manuscript. All authors contributed to the development of the protocol. Funding The Norwegian Research Council (NRC) is funding the Double Intraperitoneal Artificial Pancreas project (project number 248872) as part of the Centre for Digital Life Norway (digitallifenorway.org). The study is also supported by a scholarship from the Central Norway Regional Health Authority (grant nr 2014/23166) and the Norwegian Medical Association Johan Selmer Kvanes Endowment. The funding sources had no role in the collection, analysis or interpretation of the data. Ethics approval The study was approved by the Norwegian Food Safety Authority (FOTS-ID 10922) and was in accordance with 'The Norwegian Regulation on Animal Experimentation' and 'Directive 2010/63/EU on the protection of animals used for scientific purposes'. Data sharing statement Additional online data supplement is available.